My book, Abracadabra Cello, is based on a method of progressive bowing exercises and rhythms in the shape of popular tunes to make playing more enjoyable. 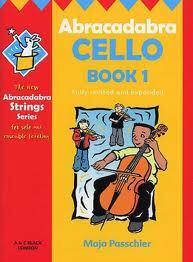 All the pieces come with a second cello part, both easy (for another pupil to accompany) or harder (for a teacher). The book includes two CDs with all the pieces, enabling pupils to learn by playing along. As the CD does not listen to you, you have to keep playing as if with a metronome (but it is more fun!). So that all the family or string groups in schools can play together, the violin, viola, cello and double bass books are all in the same format and keys. This is the only teaching method where this is possible. There is also a piano accompaniment book to go with the series.